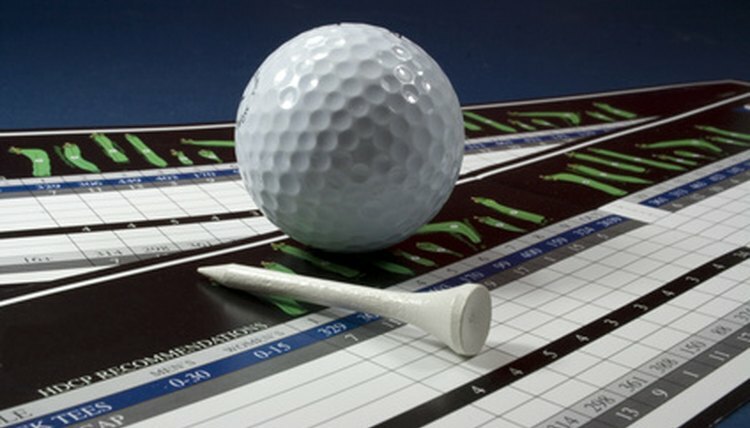 Golf scores are based on each hole played, as well as the total of all holes played in the round. The scoring system in golf is different than that of most sports, where the higher score is the winner. In golf, success is determined by the lower score, or the fewest number of shots taken on the hole or in the round. Each course has a designated number, known as par, that represents the score a skillful golfer would shoot. Furthermore, each hole on a course, typically nine holes or 18 holes, has its own par score. A course's par score is the sum of the par scores for each of the holes. Each hole has a designated par score. Par is the number of shots considered an even score. For example, a par-5 hole requires the golfer to hit five shots from the tee box to the cup in order to attain a par score. The par score for most 18-hole golf courses ranges from 70 to 72, and typically includes a majority of par-4 holes. The remaining holes are par-3 or par-5 holes. Scoring in golf tournaments typically is based on stroke play, in which every shot counts as one stroke. A player's score often is expressed in terms of the number of strokes under, even with or over the par score. A golfer who shoots a score of 65 on a par-72 course is seven under par, or minus-seven. A golfer who shoots an 80 is eight over par, or plus-eight. A golfer who scores a 72, par for the course, is even. It's better to be under par than over par, but the score may be relative to your level of competition or your personal goals. As mentioned in Section 1, a par score is attained when a golfer completes a hole in the number of strokes listed on the course scorecard. For example a par-4 hole requires a golfer to finish the hole in four shots to attain par. Par-3 holes usually are shorter holes on which golfers can hit the tee shot onto the green. Conversely, a par-5 hole might require three or four shots to reach the green. The U.S. Golf Association issued the following yardage guidelines, as of 2010, for determining the par score of a hole: par 3, up to 250 yards (men), up to 210 yards (women); par 4, 251 yards to 470 yards (men), 211 yards to 400 yards (women); par 5, 471 yards to 690 yards (men), 401 yards to 590 yards (women). A birdie is a score one stroke less than par. Birdies can be achieved on any hole, but often are made on par-4 and par-5 holes. A par-3 hole provides a tougher test because it requires the golfer to get the ball into the hole in two shots. An eagle is a score in which a golfer completes a hole in two fewer shots than par. In most cases, eagles occur on par-4 or par-5 holes. A double eagle, or albatross, is when a golfer completes a par-5 hole in two shots. A golfer would have to drive the ball from the tee and on the second shot hit the ball into the hole. An albatross is a rare achievement in golf. A hole-in-one occurs when a golfer holes the ball on the tee shot. The hole-in-one happens most often on par-3 holes, as the distance from tee to green may be manageable for many golfers. Occasionally, golfers will record a hole-in-one on a shorter (about 300 yards) par 4. A hole-in-one is considered official when a witness can verify the score. A bogey is the term used to express a score of one shot over par. Accordingly, a score of two shots over par is a double bogey, three over par is a triple bogey, and four over par is a quadruple bogey.